Traumatized by ongoing fights in Ukraine the Western community continues to challenge Russia diplomatically and with ongoing sanctions. In January alone separatists bombed Mariupol, took control over a devastated Donetsk International Airport and announced plans to further increase the number of their soldiers. When almost full attention is paid to Donbas, two separatist republics in Georgia – Abkhazia and South Ossetia – gain their momentum. Russia is gaining new ground in Caucasus and it might be more and more difficult to return to the status quo. Poland should lead the efforts of the Western community to strengthen NATO and the EU in order to deprive Moscow from its potential counter-legitimacy efforts. When at the World Economic Forum in Davos Petro Poroshenko accused Russia of maintaining 9,000 troops in Ukraine, Sergey Lavrov denied and claimed that no proof of such Russian activity existed. Words fight words and people fight people: more than 4,800 lives have been lost since April 2014 according to the World Health Organization. There are voices claiming that Putin lost his ground and is now trying not to lose his face, that the whole conflict has been a mistake and annexation of Crimea was miscalculated. Humiliated with sanctions Moscow is allegedly paying the price of its own adventurism. This may be the case because Kremlin does not seem to be in hurry to recognize two troublesome Donbas republics, not to mention their annexation. But the fog of war should rather be considered as a purposeful strategy aiming to exhaust, confuse and win time. When almost full attention is paid to Donbas, two separatist republics in Georgia – Abkhazia and South Ossetia – gain their momentum. The war of 2008 has been forgotten by many but it should not be. Indeed, the way Russia engaged in Caucasus almost seven years ago can constitute a major hint of what long-term plans Kremlin has vis-à-vis the so called Novorossiya. Concerning confusion surrounding the Ukrainian conflict and one’s inability to get into Putin’s mind, the Georgian example may in fact be the closest hint one has. Here is what happened in Caucasus since the war in Eastern Ukraine broke out in March 2014. In June 2014 South Ossetia’s pro-Russian political elites started rising voices about possible unification with the Federation: in Crimea fashion. The voices faded away and the Western community apparently became relieved that Kremlin does not plan to introduce the wider use of annexation as a new political norm of conduct. However, in July 2014 Georgia raised the alarm when Russia started fencing off South Ossetia in a “creeping annexation” fashion (an ongoing “borderization” of the Administrative Boarder Line). In August 2014, Abkhazian authorities discussed a “unified defense space” with Russia. South Ossetia quickly became interested in the idea and its ambassador to Abkhazia, Oleg Botsiev, said that his country will be the part of the project as well. 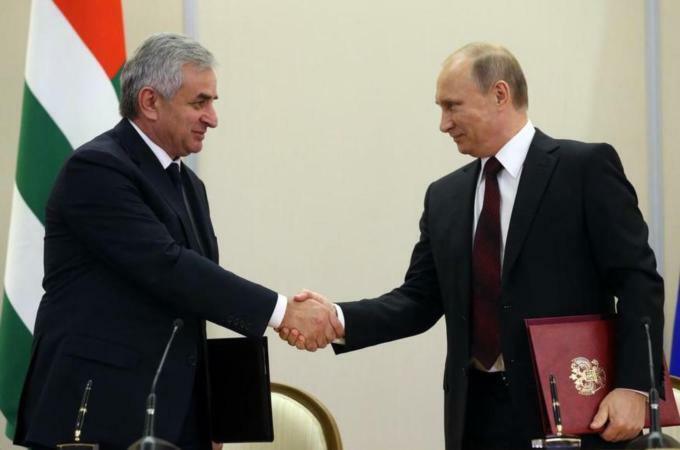 In November 2014, Vladimir Putin and the Abkhazian “president” Raul Khajimba signed in Sochi “Alliance and Strategic Partnership”. The agreement assumes boosting Abkhazian defense capabilities both by closer ties with Russian military and by modernizing the Abkhazian armed forces. Once again Kremlin denied accusations of “creeping annexation” and said that all it is doing is assuring security of an independent state Russia recognized. The move infuriated Georgia and provoked condemning responses from NATO, the European Union and the United States. Just one month later South Ossetia announced that a similar agreement between Moscow and Tskhinvali is to be signed. In the beginning of February this year the draft document was completed. It allegedly assumes deep integration with Russia, most importantly in defense and security areas. There are about 60 percent of Russians in Crimea. The number is similar for combined Abkhazian and Russian population in Abkhazia. In South Ossetia the Ossetian population alone accounts for almost 90 percent. Finally, in Donbas around 70 percent of people speak Russian as their mother tongue. It is highly probable that the “referendums” in the so called Novorossiya, Abkhazia and South Ossetia would result in unification with Russia if this question was asked and backed with an electoral fraud. But this scenario seems unlikely. The Western community would like to see Russian expansionism stopped by international isolation and sanctions. But it is doubtful that Donbas, Abkhazia and South Ossetia did not share the fate of Crimea because of that. Crimea is highly strategic because of the Black Sea Fleet and it was necessary for Putin to proceed with “surgical operation” to finally take control over Sevastopol and its surroundings. The so called Novorossiya is likely to share the faith of Abkhazia and South Ossetia within completely different Russian strategy aiming to undermine the role of NATO and the European Union in the region. Caucasus example shows that Moscow is willing to propose its own version of integration. Abkhazia and South Ossetia are no longer to be mere factors undermining Georgian integrity, but rather aim to demonstrate that the sphere of prosperity and defense can as well be provided by Russia itself. Ten of G-20 members (not including Russia) did not directly challenge Kremlin’s actions in Ukraine. There is thus some space for Russia to gain legitimacy for its policies and to construct its own counterbalance to NATO and the EU. International community should properly interpret Russian behavior. The West should not use all of its pressure tools at once because it can quickly run out of bargaining leverage. Russia is gaining new ground in Caucasus and it might be more and more difficult to return to the status quo. Poland should lead the efforts of the Western community to strengthen NATO and the EU in order to deprive Moscow from its potential counter-legitimacy efforts. The Korean Peninsula was also divided and yet the South carried on working on its own prosperity, hoping that someday it will be able to project its success across the DMZ. It is surely painful to think about Georgia and Ukraine this way but Russian determination has to be skillfully challenged: all options have to be considered.